The Weakness In Me was written by Joan Armatrading. 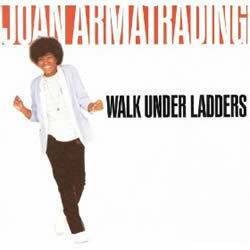 It was track 5 from the album Walk Under Ladders which was recorded in July, 1981 and released in September, 1981. Please note that you don't have to play the add9 chords. You can simply replace Em(add9), Cadd9 and Dadd9 with Em, C and D respectively - especially useful for beginners... all charts below. Chorus: Why do you come here when you know I've got trou-bles e-nough? Why do you call me when you know I can't an-swer the phone? Are you so strong or is all the weak-ness in me? Why do you come here and pre-tend to be just pas-sing by? Joan Armatrading: Born Joan Anita Barbara Armatrading on the 9th December, 1950 in Basseterre, Saint Kitts, West Indies. She is a singer-songwriter whose instruments include vocals, acoustic guitar, electric guitar and piano. She has been performing since 1972 with a variety of styles: jazz-rock, folk rock, rock, pop and blues with her favorite arsenal of guitars - Ovation, Gibson Les Paul and Fender Stratocaster. The Weakness In Me Sheet Music at MusicaNeo.Com - Piano/Vocal/Chords - 4 pages - G Major. JOAN ARMATRADING chords and lyrics are property and copyright of their owners. "The Weakness In Me" chords and lyrics are provided for educational purposes and personal use only.